This .45 ACP ammunition from Remington's Golden Saber series delivers strong penetration for reliable stopping power against an assailant. 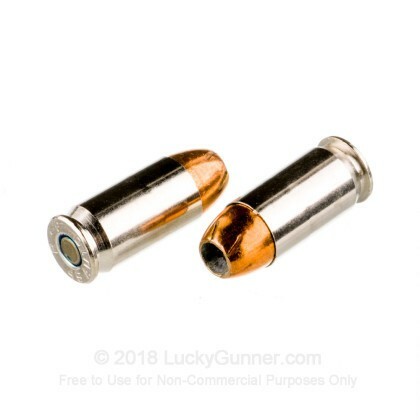 Golden Saber bullets have bonded brass jackets that hit with minimal risk of core-jacket separation. These rounds come in a convenient (and reasonably priced) box of 50 that makes training more affordable. 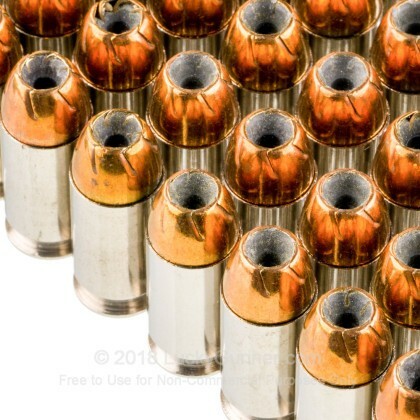 Each cartridge fires a heavy 230 grain jacketed hollow point bullet at a muzzle velocity of 875 feet per second. An excellent choice for 1911s and other .45 Auto pistols. Remington Golden Saber ammo is loaded in Lonoke, Arkansas using non-corrosive Boxer primers and nickel-plated brass cases. Nickel plating isn't just for show; it also enhances the durability of the ammo over long periods of carry. 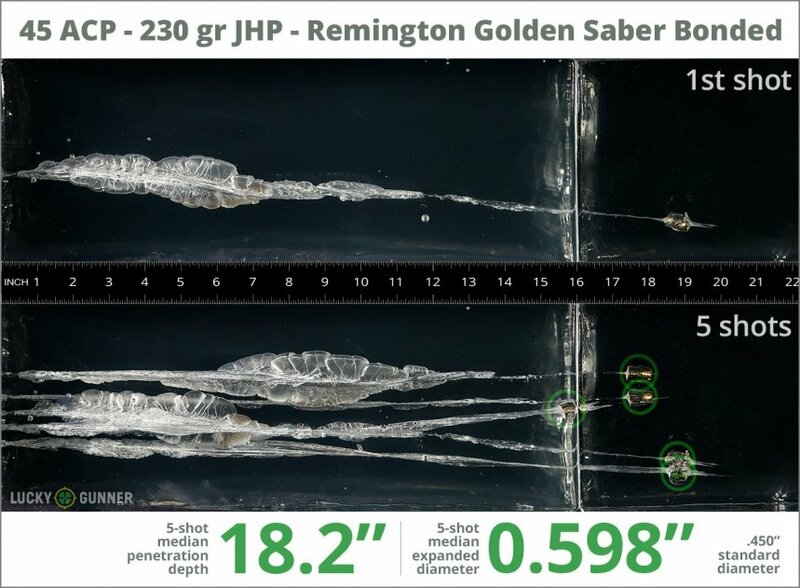 We test fired five rounds of .45 ACP (Auto) Remington 230 gr Golden Saber Bonded into synthetic ballistic gelatin to observe its expansion and penetration characteristics. The ammo was fired from a Kahr CW45 pistol at a distance of 10 feet. A four-layer barrier of heavy fabric was placed in front of the gelatin to simulate clothing. The complete data for this load from our test can be found on the chart below. The photo slider displays the expanded bullets that were retrieved from the gel. Pictured below is a high speed video that shows the bullet entering the gel at approximately 10,000 frames per second. The diagrams at the bottom of the page should give you an idea of how this load compares to other .45 ACP (Auto) loads. 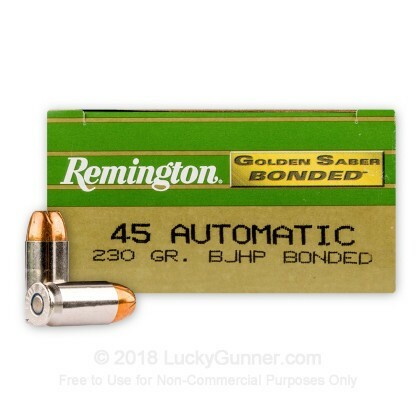 How do the results for this Remington .45 ACP (Auto) compare to other 45 ACP Ammo? 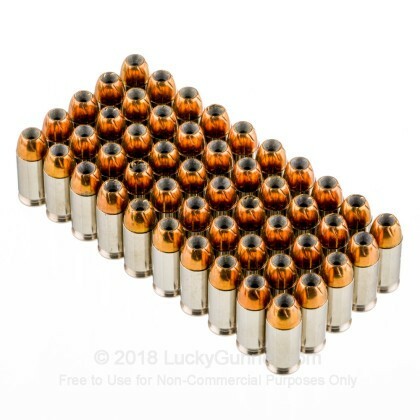 1.04" This ammo: 0.60" Min: 0.45" Median: 0.64" Max: 1.04"
18.2" 0" 8.3" 16.7" 32" This ammo: 18.2" Min: 8.3" Median: 16.7" Max: 32"
We don't have any reviews yet for this particular .45 ACP (Auto) ammo from Remington. 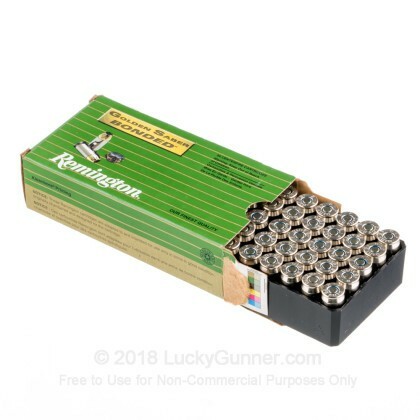 If you'd like to be the first to review this particular .45 ACP (Auto) ammo from Remington, fill out the form below. 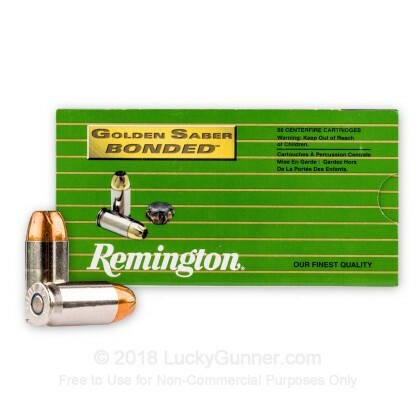 We also have this 45 ACP - 230 Grain Bonded JHP - Remington Golden Saber - 500 Rounds ammo in stock in a bigger quantity.